We’ve had quite a busy week here in South Florida tracking Hurricane Matthew which (thankfully) skirted along Jupiter’s coastline, leaving behind very little damage in it’s wake. Our thoughts and prayers are with the residents of Northeast Florida, Georgia, and South Carolina, who are readying for flooding rains and high winds from the Category 2 storm. According to ABC News, four people died as a result of Matthew (2 in St. Lucie County) and over 1 million people are without power. Always be prepared for a hurricane – take the time to install and close your hurricane shutters, stock up on bottled water and non-perishable foods, fill up your gas tanks and generator with fuel, and have a communication plan in place to contact friends and family after the storm. Even though Jupiter was spared the worst of Matthew, a slight wobble of the storm could have pushed a Category 4 hurricane ashore in Palm Beach County. For more information on hurricane preparations, visit the National Hurricane Center’s website. My next post (sometime in the coming week) will cover hurricane preparation basics and ways that my family likes to prepare for the storm. 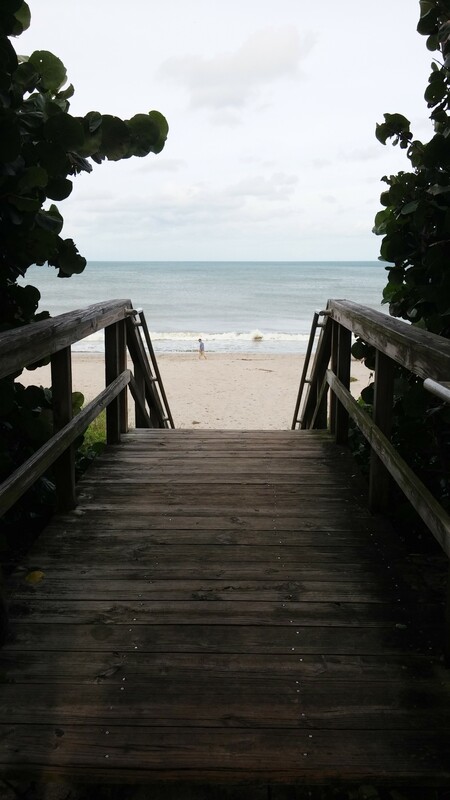 Seriousness aside, there is one telltale sign that you’re a Jupiter native: You know you’re from Jupiter when the first thing you do after a hurricane is drive to the beach to make sure it’s still there! Even my Georgia boy P asked this afternoon if we could drive up to the coast and take a look. Of course, this is ONLY if it’s safe to venture out from your house. We were surprised at how calm the seas were already. The scattered surfers could barely catch a wave. Cooped up residents let their dogs roam free in the surf. A few die hard beach-goers even brought chairs and books and were already working on their tans. We even saw a family unloading out of a giant van, everyone ready for an afternoon at the beach. Most people were like me and P, though – curious to see the state of the beach, hoping that one of Jupiter’s natural treasures hadn’t been washed away into oblivion. Rest assured, the beach was still there, every sandy, salty inch of it. Something that has suffered from Hurricane Matthew, however, are the sea turtle nests. This year, turtles broke statewide nesting records, with over 15,231 nests counted on our stretch of seashore alone. Since the storm, a myriad of eggs litter the beach, washed from their nests buried under the sand. The Loggerhead Marinelife Center asks that exposed and washed out eggs be left in place on the beach, as unfortunately they are no longer viable. If you see stranded hatchlings, please bring them to the Loggerhead Marinelife Center and place them in the cooler located at the front entrance of the building. Do not put the hatchlings in water, as they can drown. The best method of transportation for baby sea turtles? An open container filled with damp sand. We are so grateful that Jupiter was spared the wrath of Hurricane Matthew. We continue to keep the east coast of the United States in our prayers as well as Haiti and the Bahamas during their relief efforts. The power of a hurricane should never be underestimated! Stay safe, Georgia and South Carolina! Absolutely! Always the first thing we do!! It was heartbreaking to see all the turtle eggs. Glad you fared well.